Liz Taylor is an illustrator, cartoonist and storyteller. Liz created the illustrations for “DyslexiaLand: A Field Guide for Parents of Children with Dyslexia.” Her work brings a smile, and sometimes a tear, by telling stories through whimsical pictures and characters. Much of her work explores the challenges children face in school: feeling overlooked and misunderstood, overcoming learning disabilities and social issues like friendship difficulties. She often communicates her ideas about school experiences through the tools children use to learn, like books and school supplies. 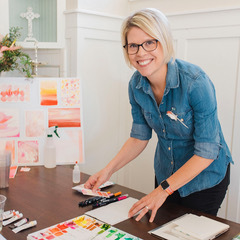 As the parent of a dyslexic child, Liz lent her artistic talents to support the campaign that promoted passage of the first dyslexia law the State of Arizona in 2015. Her illustration, “A Day in the Life of a Courageous Dyslexic Student,” received national recognition by the advocacy groups Bright Solutions for Dyslexia and The Dyslexic Advantage. Liz resides in Phoenix, AZ with her husband and two neurologically diverse children. Her work can be found on Instagram at @liztaylorcreative or at liztaylorcreative.com.